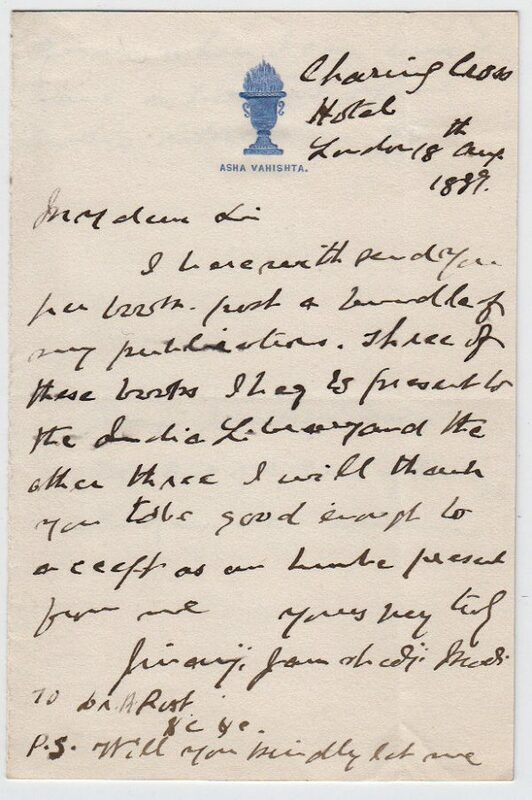 An original Autograph Letter Signed, to Dr. Reinhold Rost, sending “a bundle of my publications”, three for the India Office Library, and three for himself. 1 page 6 x 4 inches, with an annotation by Rost overleaf, in fine condition. Charing Cross Hotel, 18 August 1889. Dr. Sir Ervad Jivanji Jamshedji Modi (1854-1933), who also carried the title of Shams-ul-Ulama, was a prominent Zoroastrian Indian priest, scholar and community leader. One of “the most decorated priests in history”, he wrote over 70 books, produced over 120 scholarly papers on Zoroastrian history, traveled and researched into Zoroastrian affairs extensively and was instrumental in organizing the Parsi community in India. Reinhold Rost (1822-1896), German born orientalist, secretary to the Royal Asiatic Society (1863-69), librarian at the India Office (1869-1893).